After the last post on coal generation, I thought it would be nice to cut a few steps out of the photon processing, avoiding all the dirty gunk that gets picked up along the way, and talk about straight-up sunlight. You probably know by now (also the title's a total spoiler), but this post is going to be about solar generation. So, I think a small discussion of technologies is useful to get some background before diving into the delicious numbers. First, 4 prime movers are represented in the data: PV, ST, OT, CP. PV - You were probably able to guess this one, it's photovoltaic. Photovoltaic installations are the typical depiction of solar panels on roofs. Slabs of silicon that directly convert photons into electricity. This property that is unique to this form of generation, not just amongst solar technology, but all of our generation techniques for any fuel source. What I find particularly amazing is that the photovoltaic effect was first noted in 1839. It's fun to think about an alternate history in which we were able to produce workable solar panels in the 1800s. ST - Steam turbines. Steam turbines + solar can also be referred to as solar steam. This is probably the other technology you've heard of, at least in passing. The general idea is to concentrate heat using reflective plates. This heat is then used to drive a traditional steam turbine. OT - Other. There's only one of these, and it's not listed explicitly in the data, but thankfully the operating utility and year is, and a little googling turned up this article. Based on that piece, I believe this 1 MW installation to be a concentrated solar power demonstration plant utilizing parabolic troughs. CP - Energy storage, concentrated solar power. Like OT, there's only one of these in the EIA's data. This generator is one of the Solar Energy Generating Systems (SEGS) in California. Specifically, I believe it is SEGS I. Fun fact, a nearby solar installation inspired a side-mission in the video game Fallout: New Vegas. With a little bit of background, let's get into the number. As always, I'm rocking the data off of that October-fresh EIA-860 form. A lot of the data in this post would have been wildly different a year ago, so it's really nice to have the updated numbers. Let's start with a basic breakdown of the generation types I just discussed. Now, how about a breakdown of the PV and ST installations. If you're curious, the capacity of the CP generator is 13.8 WM, and the OT generator is 1 MW. And finally, the same breakdown, but for all the solar installations together. If PV's dominance wasn't terribly obvious from the first table in this post, it should be now. The sheer number of PV installations compared to ST and the others allows it to define all of the operation date categories, and maintain a statistical stranglehold on the capacity values as well. Before moving away from the basic information I'd like to throw 2 maps at you to get an idea of the spatial distribution in solar generation. 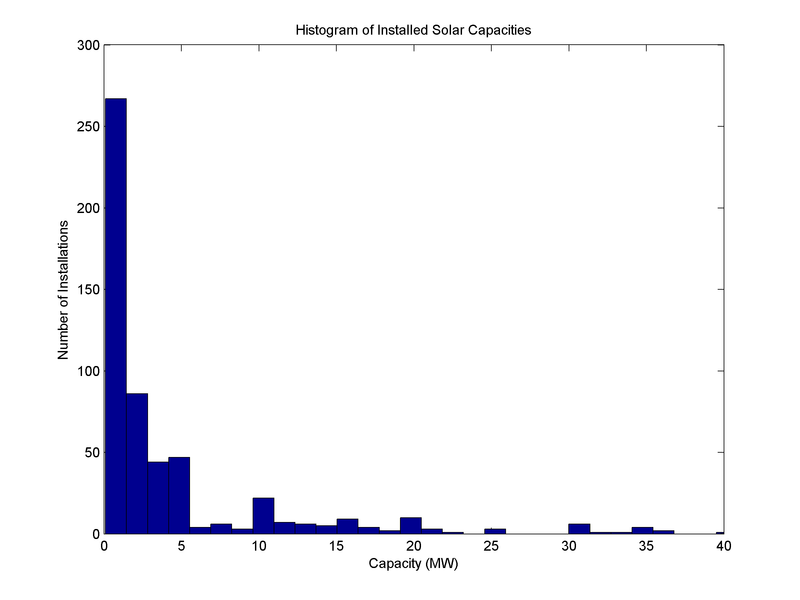 A glance at some basic histograms illustrates the capacity values and installation ages above. Unsurprisingly, most solar generators are under 5MW, with the bulk of those actually at 1MW or less. 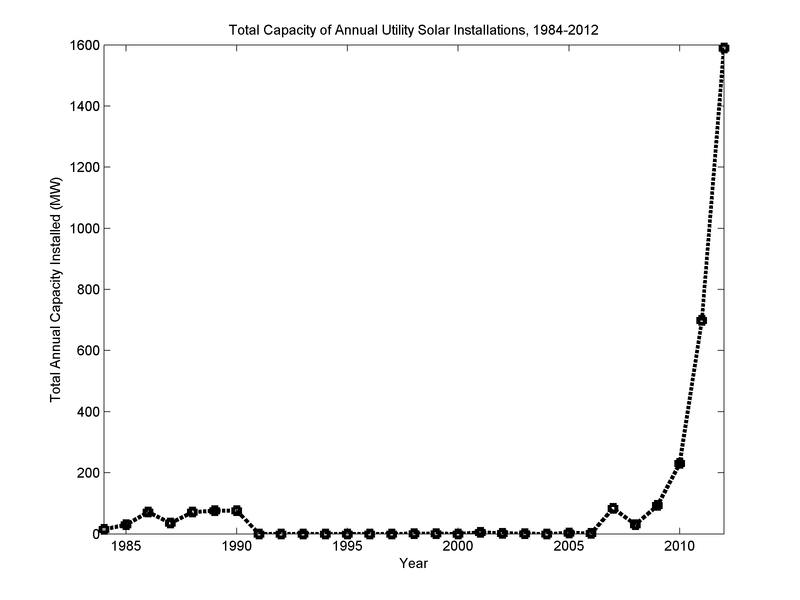 Mirroring the capacity graph, the number of annual installations show a sharp rise that began less than 10 years ago. 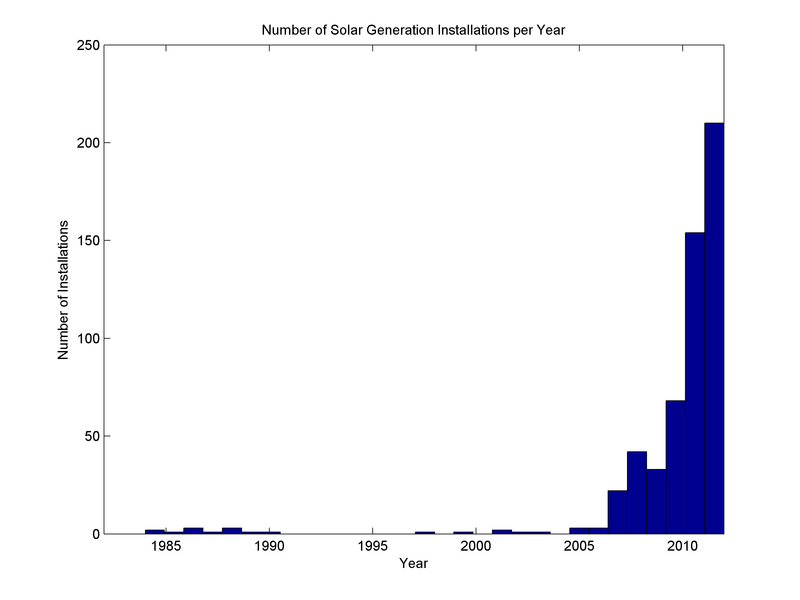 As I mentioned at the beginning of this post, the 2012 numbers are dramatic, and reaffirm the trend of solar as a growing energy source in terms of installations. However, due to solar's capacity factor, conversion losses, and lack of storage available 1000 1MW generators could produce less useful energy than a 600MW coal power plant. In its current state, solar isn't all the great for peak power, so it generally is going to be contributing to baseload. But why would what appears to be 1000MW of solar generation produce less energy than a 600MW nameplate coal power plant? 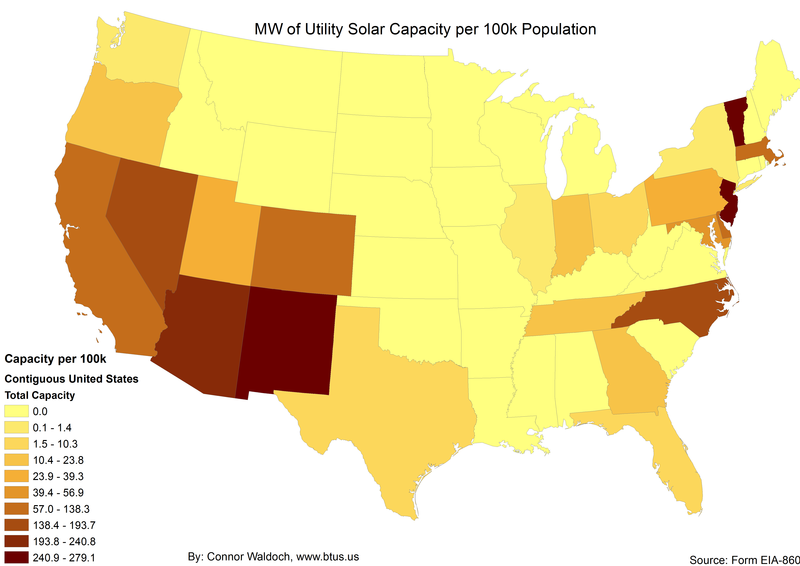 I mentioned a few factors above, but the major one with solar is capacity factor. I've mentioned it several times before, but it still might not be clear exactly what a cpacity factor is. Lots of people get confused by it (as I recently found on reddit), but it's a simple, albeit very useful, metric. Essentially, capacity factor is the actual energy production over the theoretical energy production. Let's take our theoretical 1000MW of solar, and 600MW of coal. Typical capacity factors for coal and solar are around 80% and 20% respectively. The idea of a capacity factor is a nice as an easy metric for industry folks to make quick assessments with. It's important to note that some generation technologies have low capacity factors by design because they just aren't used all that often. Natural gas peaking turbines occupy this niche, and I'll discuss that further when I get to the natural gas post. Coal and solar are not a part of that same niche. Both of these technologies either are already run as close to 24/7 as possible (coal), or that is the eventual goal (solar, some sort of satellite-based microwave solar could achieve a pretty high capacity factor[hell, with the cost of one of those systems, it better]). So solar's capacity factor isn't great, but there have been a huge number of installations in the past few years, which should add up. Right? 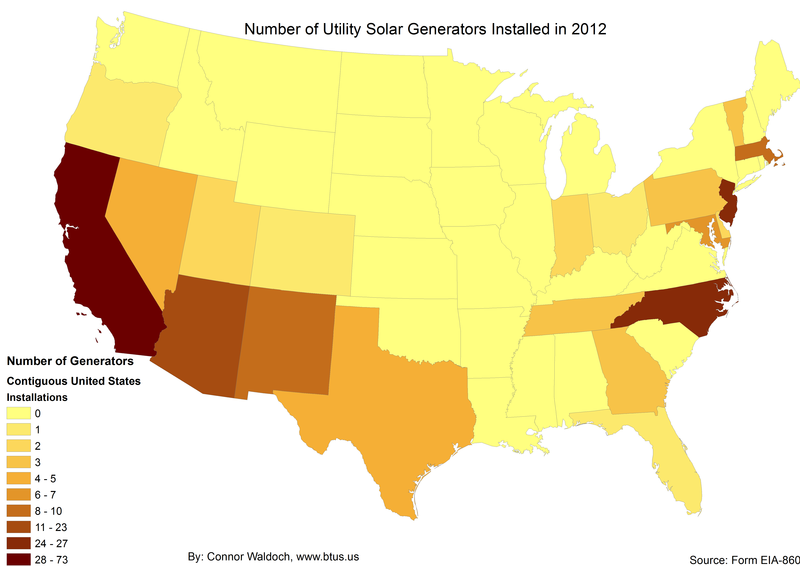 At this point it might be interesting to look at maps of just the 2012 installations. Perhaps California is installing loads of capacity in a handful of installations, while states further back on the solar uptake curve are experienced spurts of growth in smaller generators? So, overall, the answer is "not really." 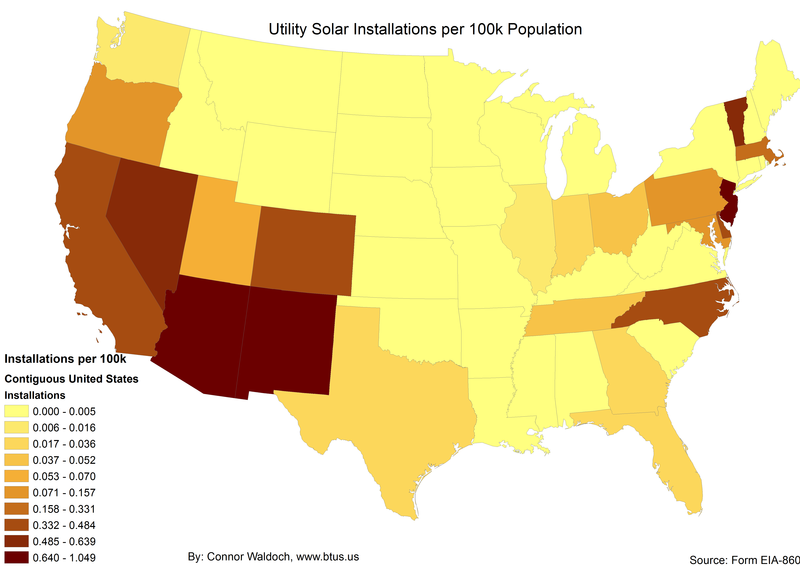 California's pace of installation and the relative capacity of those outstrips almost every state by a huge degree. However, there are two other visualizations that may present a different picture. One has to do with Renewable Portfolio Standards (RPSs), which I will save for a future post. The other has to do with population. California's a big state. It has 12 million more people than the 2nd most populous state, Texas. Only 6 states even have 12 million people altogether. So, what if I rolled back to the original 2 maps, but did everything in terms of a state's population? So California gets dethroned on installations per 100k people, but the more dramatic drop is in its capacity, which isn't surprising given its population. 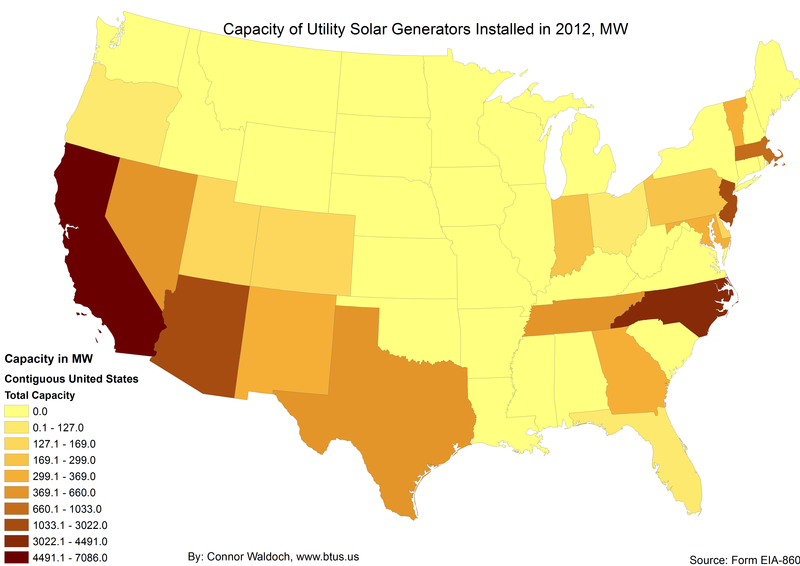 Here are the top 10 states, sorted by capacity, then installations. This list might have been surprising 6 maps ago, but I bet you could guess most of them right now. Also, because I can't help myself, I've labeled each state with how they voted in the last election, and the political affiliation of their governor. I believe that a state's standards on renewable energy are a product of both their government and the people. Immediately, I want to say that I feel bad about Hawaii, because I've kept it and Alaska off of all the maps I've made so far. The reason is partially for ease of aesthetics, but also because each of those states is highly anomalous compared to the contiguous states. I'll try to mix them in sometime, maybe they'll each get their own post (Alaska and Hawaii both have completely different, largely uncharted, and totally intriguing resource bases), but for now they'll just occasionally pop up in tables. Hawaii aside, there are a few things I find very interesting about this. 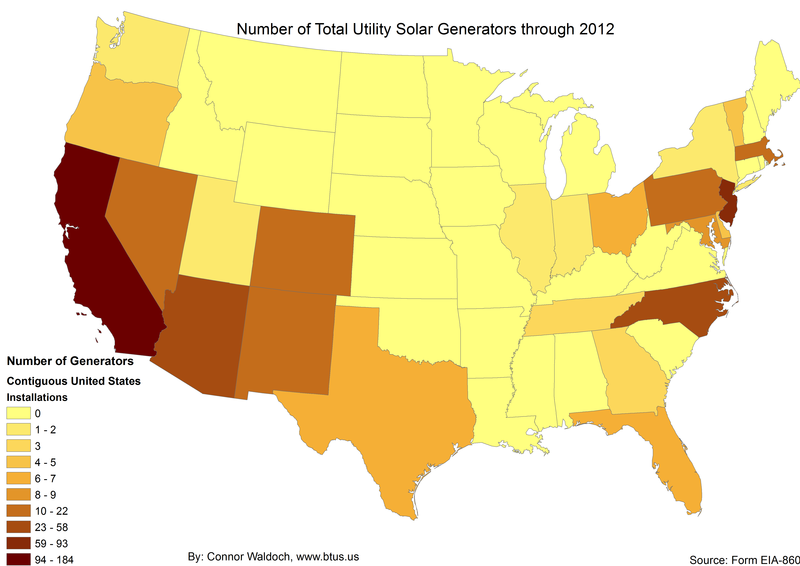 Foremost is the myth that solar only works in the Southwest. Realistically, solar can work anywhere, it just depends on what kind of installations are being considered, and what output you expect. 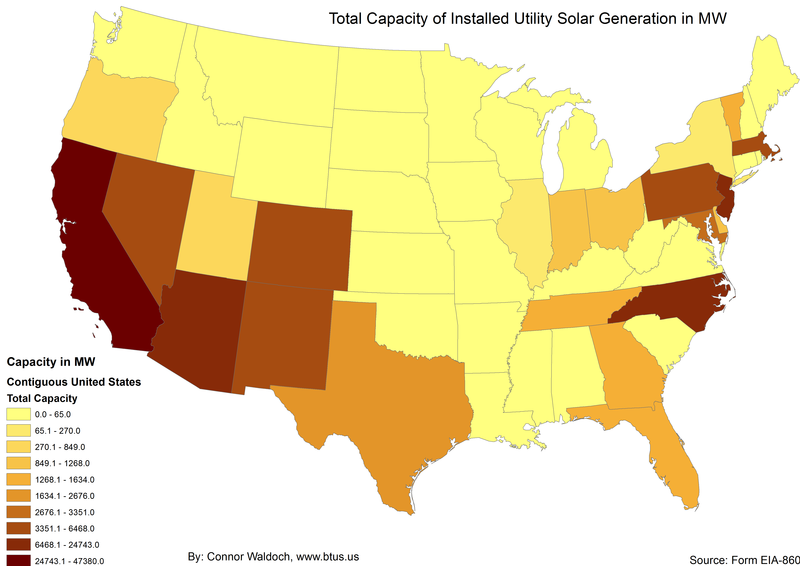 The Southwest is almost certainly the best bet for huge multi-gigawatt plants, but New jersey and Vermont, neither of which is notoriously sunny, make it clear that with the will to do so solar installations can happen. As for the political spectrum, I was largely thinking ahead when I added those, as I'll be doing some kind of political post in the future. For now though, I think it's interesting that the state's general populations seem to be more Democratic than the average, while the governorship is more split between Democrats and Republicans. This post was a bit light on text, as my brain seems to be running out of fuel as it near 10pm on a Saturday, but hopefully the cavalcade of figures was enough to keep at least a few people amused. As always, if you have any questions about methods, data sources, or simply want to rant at me, hit up the comments.